Agatha was born Dec 12,1929 to Christian & Lydia Rasch in Halliday, North Dakota. Add your memories to the guest book of Agatha Schossow. 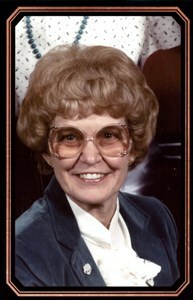 I was honored to have known Grandmother for over 20 years. She was a beautiful lady, so kind and caring. I admired her and her loving relationship with her soulmate. I remember going often to their home because I felt loved and welcomed and I enjoyed hanging out with grandmother, grandfather, Shirley and Dempsey. My daughter Julia had a special relationship with Grandmother. We will truly miss this wonderful woman. I am sorry I will not be able to attend services for Agatha but know you are all in my prayers. One of my best friends' mom. May you rest in peace. I am sure you are hugging Brenda about now..And Shirley too. See you all one day! I remember the motor home. Hanging out with my cousins. Always laughing and having such a good time. Aunt Agatha always had the biggest smile. I always felt so much love when with Aunt Agatha. She'd always laugh and say to me that's good.